Like the other women Impressionists, Gonzalès could not attend the Ecole des Beaux-Arts, the prestigious art school as women students were forbidden. 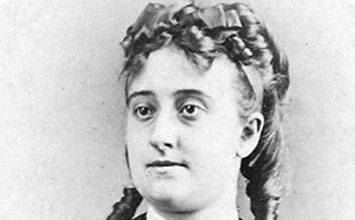 Fortunately, her upper-class status provided her with the financial resources to pursue her artistic career and, after training for a while with Charles Joshua Chaplin, a society painter connected to the state-funded French Academy. 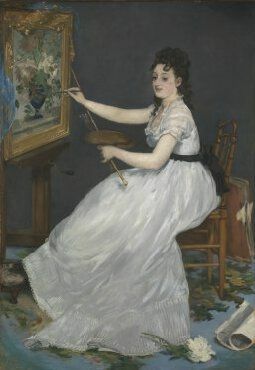 In 1869, she met the avant-garde painter, Édouard Manet. By all accounts, he was very drawn to Gonzalès and, in addition to forging a friendship with her, took her on as his student - the only student he ever accepted, although by all accounts the arrangement was not particularly formal. He had met another one of the women Impressionists, Berthe Morisot, and, by all accounts, was equally taken with her, also painting her portrait on multiple occasions as he had Gonzalès's but never taking her on as a student. Either way, having the support of Manet was no small thing as he was a major figure in the avant garde art scene; he had challenged the artistic establishment repeatedly, submitting daring, unconventional works like Le Déjeuner sur l'herbe (Luncheon on the Grass, 1862-3) and Olympia (1864) to the official Salon only to have them rejected but gaining public and critical support in the process. Gonzalès never exhibited her work in any of the Impressionist exhibitions but, because of her painting style, she is identified with the group. She and her husband Henri Charles Guérard (the fairly famous and celebrated French engraver and lithographer) were friends with many painters, including Paul Cézanne. 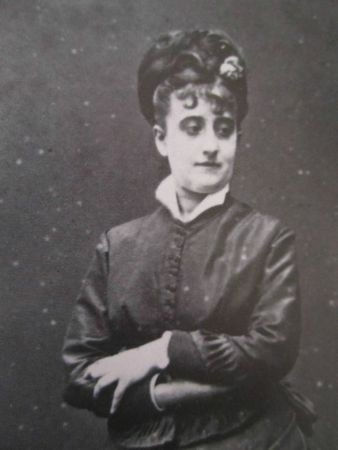 Her career and life were tragically brief, however, as Gonzalès died in 1883 at age 34 from complications in childbirth, and therefore did not have the opportunity to continue developing her work. A retrospective of her work that included around 90 paintings and pastel drawings, was held in 1885 at the Salons de la Vie Moderne in Paris. The most common themes of Gonzalès's paintings and drawings were portraits, still-lifes, landscapes, domestic scenes of women and children, and portraits. 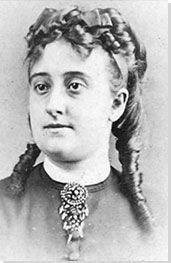 As a woman artist, she was significantly hindered in terms of appropriate subject matter. Unlike her male Impressionist colleagues, she could not wander the modern city seeking out scenes of daily life to paint as they did. Despite being a relatively prolific artist during her short life and career, Gonzalès has been better known for her connection to her teacher, Édouard Manet. Her work is, more often than not, compared to his, generally in the context of a lack of originality or in the spirit of homage. Additionally, Gonzalès is discussed in relation to the Impressionist movement and Manet in relation to a portrait he produced of her in 1869 shortly after they met, Portrait of Mademoiselle Gonzalès. In the portrait, Gonzalès wears a fine dress, one far too expensive and wildly inappropriate for painting. The portrait has been interpreted in a variety of ways but possibly the most accurate is the assertion that Manet was emphasizing the difficulty women painters had in being respected for their work on par with their male colleagues. By the mid-1870s, Gonzalès began to experiment with other media besides oil painting and became quite skillful in the use of pastels. As with other Impressionist artist who produced extensive drawings that stood on their own as finished works rather than as studies, Gonzalès's pastels may well be her most successful works. First published on 20 Feb 2017. Updated and modified regularly.